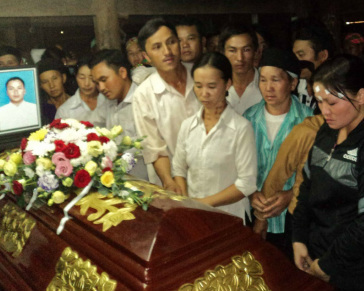 On June 11, 2014, Tran Dinh Toan, 54, died three hours after being taken into police custody in Nam Dinh province to question him about possession of drugs. Vietnamese and international human rights groups have documented torture and lethal beatings by police of detainees in police stations and pre-trial detention centers in all regions of Vietnam. According to the Vietnam Human Rights Network and other rights groups, at least nine people have died in police custody this year. Ly Vi Hung, 29, was arrested on February 9 in Saigon on suspicion of theft. He was detained at District 11 police station in Saigon until March 20, when police informed his wife that he had been taken to the emergency room of a local hospital. He died there the next day. Police attributed his death to a fall while bathing. The family, which filed a complaint seeking an investigation, said that Hung's body was heavily bruised and there was a wound on the back of his head. Police officials later said that his injuries may have been cause by beatings from other prisoners. The funeral of Hmong church leader Vam Ngaij Vaj, who was beaten to death in police custody in Dak Nong province on March 17, 2013. Many detainees are beaten upon arrest by police or during transit to the police station. Those involved in unauthorized protests or religious gatherings are subject to beatings and excessive use of force by police seeking to disperse the gatherings and carry out arrests. The beatings continue during the first several days in police custody at the local police station, jail, or lockup, when most political and religious detainees are held incommunicado and denied any contact with family members or a lawyer. In some cases, police beatings of detainees during their first few days in custody result in death. · In 2008, Dak Lak police arrested Y Ben Hdok and beat him to death in custody after other Montagnards in his district tried to flee to Cambodia to seek political asylum. After his arrest, his family was not allowed to visit him for three days, when police told them to pick up his battered body. According to his family, his head was bashed in, his ribs and limbs were broken, and his teeth had been knocked out. Police labeled the death a suicide. · In 2007, the government-recognized Evangelical Church of Vietnam reported that a Montagnard Christian of the Ede minority group died in Phu Yen province after being detained and beaten by police for not renouncing his religion. · Another Montagnard, Y Ngo Adrong, 49, died on July 13, 2006, several hours after being summoned to the district police station in Ea H’leo, Dak Lak for questioning about international phone calls he had allegedly had with Montagnards abroad. U.S. Department of State, “Vietnam 2012 Human Rights Report,” Country Reports on Human Rights Practices for 2012, April 19, 2013; Human Rights Watch, “Vietnam: Widespread Police Brutality, Deaths in Custody,” September 22, 2010. “Many Police Accused of ‘Violence’” (Nhieu cong an vi to “bao hanh”), BBC Vietnamese Service, March 27, 2013; “Hmong Dies in Police Custody” (Nguoi Hmong chet tai cong an Dak Nong), BBC Vietnamese Service, March 24, 2013; “Them mot nguoi chet tai don cong an tinh Dak Nong,” Radio Free Asia Vietnam Service, March 23, 2013; Nguoi Viet, “Third Person dies in the Hands of the Police in 2013,” April 8, 2013; Human Rights Witness, “Vietnamese Police Beat Hmong Church Leader to Death,” April 22, 2013. U.S. State Department, Bureau of Democracy, Human Rights, and Labor, “2008 Country Reports on Human rights Practices: Vietnam,” February 25, 2009; Human Rights Watch, “World Report 2008: Vietnam,” January 12, 2009. Human Rights Watch, “World Report 2008: Vietnam,” January 12, 2009.